Published October 2016: After 22 years of having to hide behind my “fictional” account of events, whilst also suffering chronic posttraumatic stress disorder (PTSD), I have, after many many months of counselling and treatment decided to publish this page. My hope is, by finally publishing the facts behind my case and making public the reality of what can happen within our justice system, it will help raise awareness and understanding by shining a light on the many ways individuals and groups within the police, CPS, and courts misuse and abuse power and control. Converging misinformation with fact, creates the predestined and inevitable outcome… an unjust guilty verdict, a verdict based on a set of lies agreed upon. Politicians and policy makers are clearly aware of those abusing the system, but are often too scared to expose those involved. By publishing what happened to me, I hope it may cause the powerful individuals involved, to reflect on what they have done and stop subjecting others to such ordeals. It’s also my hope that the establishment will surely finally stop pretending that what happened, didn’t happen. If they don’t, our Home Secretary will be guilty simply by association! This page is regularly updated as documents are sourced. 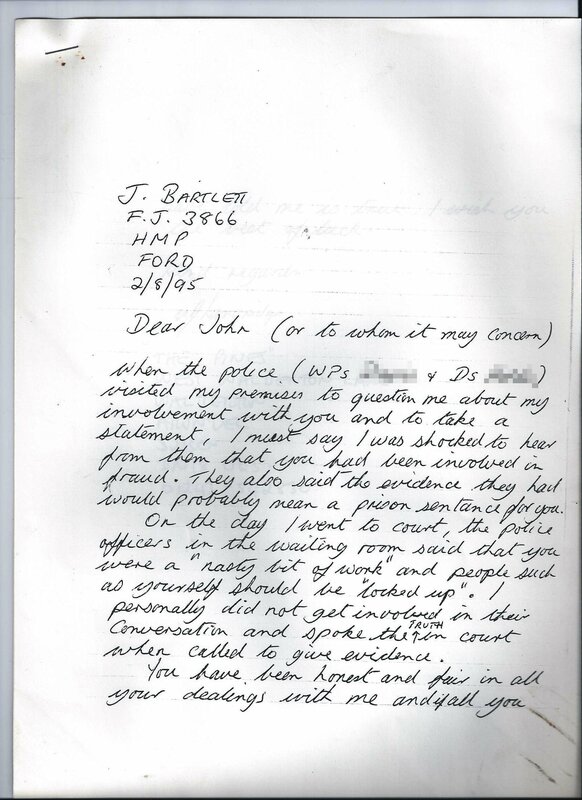 We are currently making Freedom of Information Requests to obtain all Home Office, CPS and Crown withheld documentation relating to the trial of John Bartlett in 1994, and in particular, the CROWN blocking and refusing to allow an appeal to be heard. As files and documentation are obtained, they will be displayed/updated publicly on this page. A guilty verdict can only be challenged/appealed if new evidence comes to light. N.B. THREE are Crown Witnesses, called by the Prosecution! N.B. Justin EVERETT, Director of Tyser Special Risks (who sold the **Prize Indemnity policy ), gives a statement to DC Terry Stroud (January 1994). Within days of the statement/police interview, Justin Everett “resigns” from Tyser Special Risks. N.B. His Honour Judge MacRae rules that the Jury must NOT be told that Justin EVERETT, the Broker & Director of the Prize Indemnity, was in fact, also the 3rd driver in the Prize Indemnity Team, Star Union (along with John Bartlett & Robin Donovan). N.B. Consolidated Marine & General is liquidated and declared insolvent on 23 Jul 2000, following PPI Scandal. Private Detective Instructed by Consolidated Marine & General (liquidated): Mr D.B. Else, Close Observation Personnel (liquidated), had accidentally been watching/photographing the wrong person… i.e. not John Bartlett! 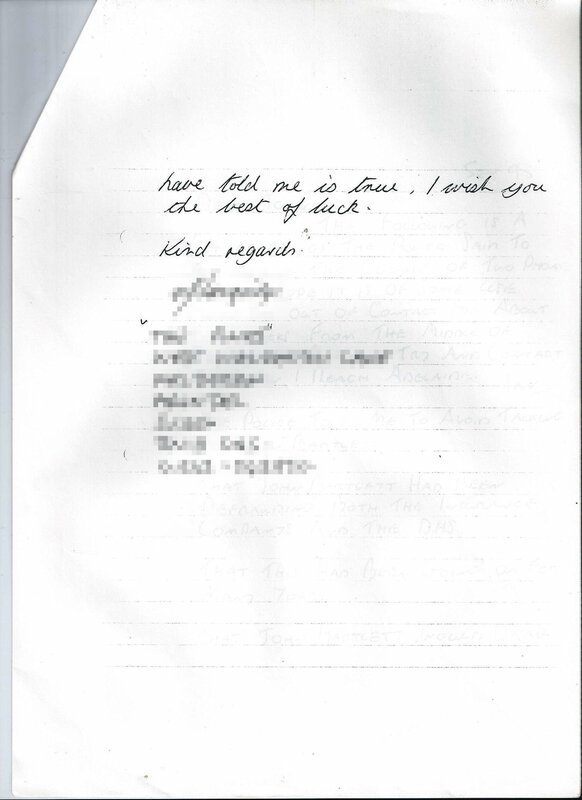 On 2nd February 1993 DC Terry Stroud drafts a statement himself on behalf of a key CIGNA witness, Mr G.E. 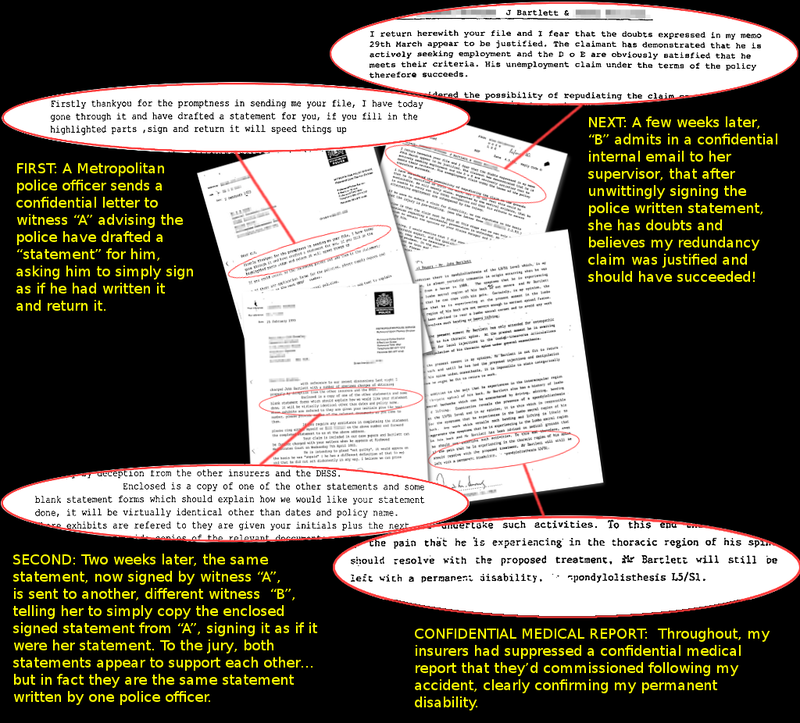 Good (Witness “A”): After getting Mr Good to sign it, DC Terry Stroud sends a copy of Mr Good’s statement, to General Accident (GA) on 25th February 1993 and asks GA’s Mrs S.M Bramley (Witness “B”) to copy and sign it, as if it were written by her (click image below to see a full size). Trial Judge MacRae allows DC Terry Stroud and DC Garry Staunton to stand at the back of the court (before giving evidence themselves) as Mr Good and Mrs S.M Bramley “reenact” the events written for them by the 2 officers. CROWN WITNESS – Justin EVERETT, the Broker & Director of the Prize Indemnity, was in fact, also the 3rd driver in the Prize Indemnity Team, Star Union (along with John Bartlett & Robin Donovan). His Honour Judge MacRae allows DC Terry Stroud & DC Garry Staunton to stand at the rear of the court, listening to key witnesses giving evidence, prior to them giving evidence themselves for The Crown (this is NEVER normally permitted). Judge MacRae only asks the 2 officers to leave after John Bartlett complains to his legal team. N.B. His Honour Judge MacRae is handed an important official letter from Dr Matthews, head of psychology at Graylingwell Hospital. 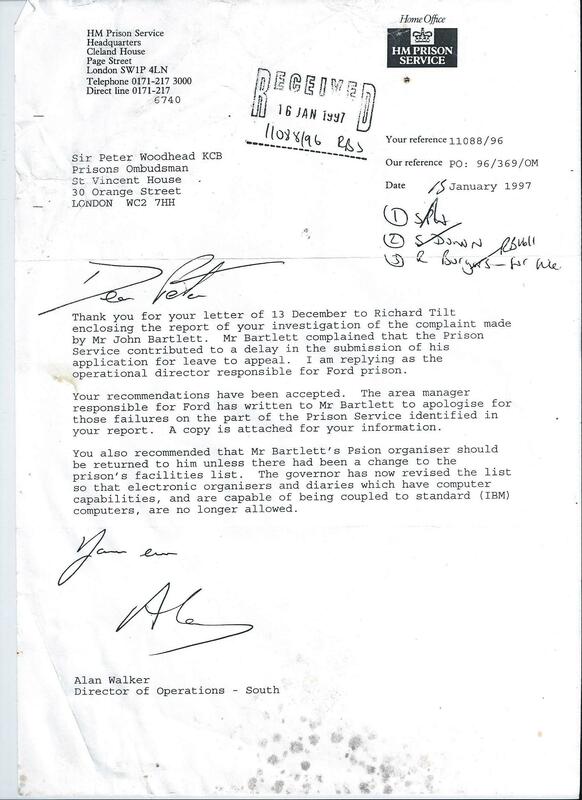 The letter, dated 30th January 1995, advises the Judge that John Bartlett has NOT been discharged from Graylingwell Hospital and must be returned to hospital for ongoing treatment, NOT sent to prison at that time. N.B. 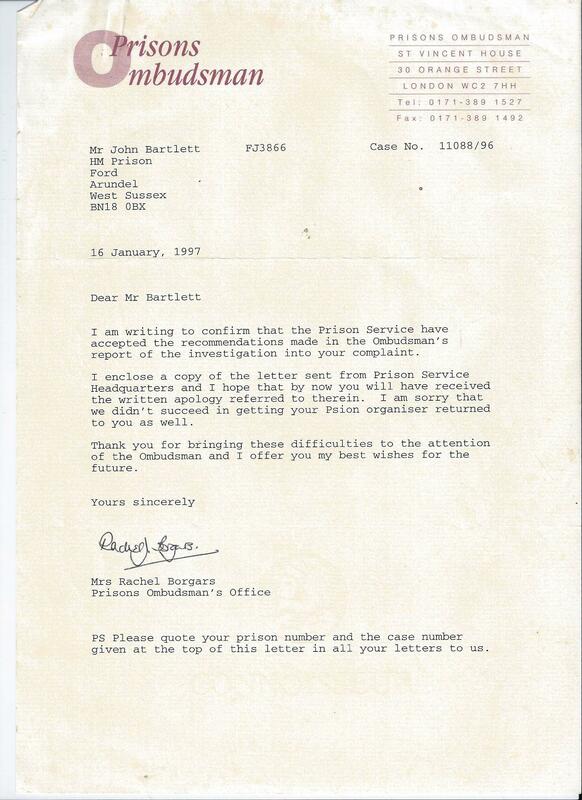 His Honour Judge MacRae despatches John Bartlett to HMP Wandsworth immediately and disregards the letter in full. 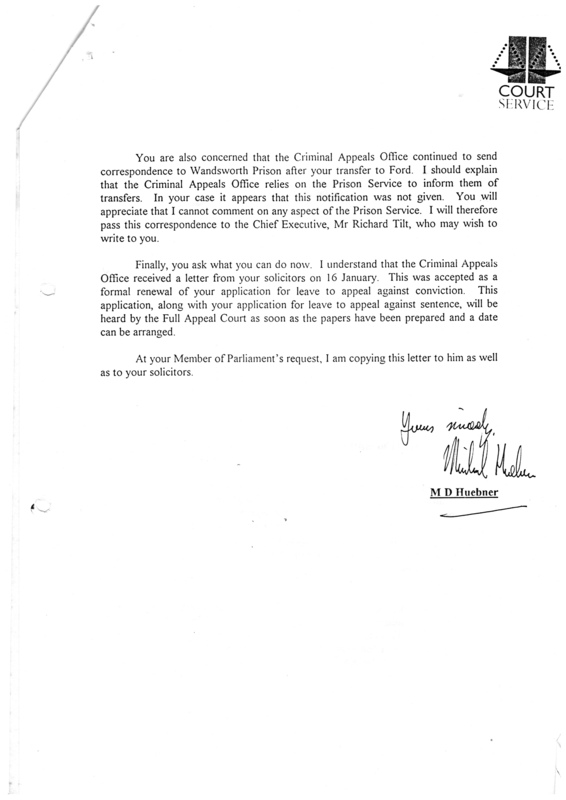 Mr Justice Hollis blocks leave to appeal due to being “out of time” as John Bartlett was in Graylingwell Hospital. Any appeal should have been submitted within 28 days! N.B. 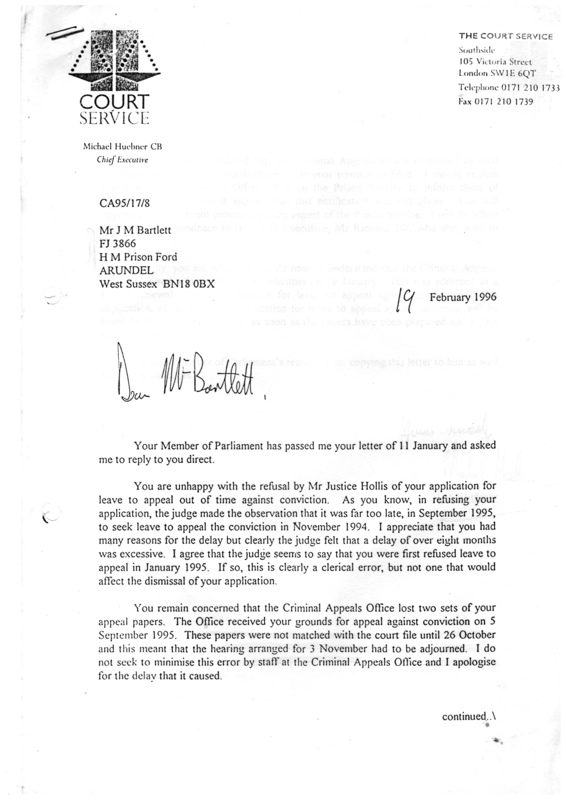 John Bartlett had been in Graylingwell Hospital during the 6 weeks following the trial, but Mr Justice Hollis could still not understand why the appeal paperwork wasn’t submit within the required 28 days. N.B. The Criminal Appeals Office admitted losing TWO earlier sets of Appeal Applications from John Bartlett, but says… any appeal has to be submitted on time and any delays caused by The Criminal Appeals Office losing the paperwork is irrelevant! N.B. 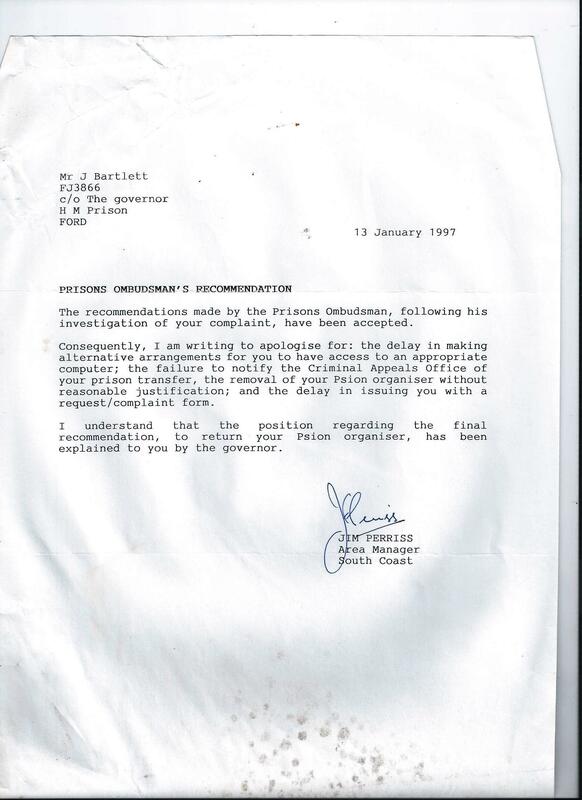 The Court of Appeal also wouldn't take into account the months and months of delay caused by HM Prison  Service... despite a judgement in John Bartlett's favour by The Prison Ombudsman (see letter below). The appeal should simply have been submitted on time! 2nd October 1998: Any thoughts of future security shattered, crippled with anxiety, stress and yet to be diagnosed PTSD, the family, with two young sons and their Golden Retriever,  leave England. Driving more than 6,000 miles overland in a 10 year old Jeep to Madagascar for the secure isolation of the Madagascan rainforests. I will answer all questions as honestly as I can. NOTE: This page relates to the Authors actual case in 1994… I am obliged to reiterate that Chequered Justice (first published November 2010) is a novel based on a true story. Thank you all who have given great reviews and nice comments – much appreciated!